Like clockwork, another IFA means another batch of new Sony phones to check out. And while recent years has seen the company abandon its Z-series branding to dabble with another letter at the end of the alphabet before coming back around to Z again, there’s a growing feeling that, at least in the U.S., Sony is just kind of shoveling them out. Not a bad looking pair, but not very exciting either. Take the newly launched XZ1 and XZ1 Compact for example. Priced at $700 and $600 respectively, Sony’s 5.2-inch and 4.6-inch handsets look like interesting alternatives to the stampede of Apple and Samsung devices. Specs wise, they tick all the right boxes featuring Qualcomm Snapdragon 835 processors, 4GB of RAM and sharp 19-megapixel rear cameras with 5-axis image stabilization and the ability to capture super slow-mode clips at up to 960 fps. Both phones will also run Android 8 Oreo out of the box, and Sony says that with its new near stock implementation of Google’s OS, it should be able to push out updates faster than other phone makers with complicated skins (I’m looking at you Samsung). And in a move that bucks a lot of current trends, the XZ1 and XZ1 Compact will even come with true front-facing stereo speakers, microSD card expandability, IP-68 water resistance, and both a USB-C and 3.5mm audio jacks. Look how cute the little XZ1 Compact is. I think the XZ1 compact is particularly impressive, especially in a time when phones are trending larger, not smaller. People who want a small phone with flagship features don’t have a lot of options—it’s basically the iPhone SE or bust. But the XZ1 Compact doesn’t appear to compromise on speed, camera or build quality—all while still maintaining petite, hand-friendly dimensions. The main differences between the Compact and its larger sibling are smaller base storage (32GB vs 64GB), a lower res screen (720p vs 1080p), and the lack of HDR video support. But where things start to go south are on little details like the phones’ built-in fingerprint readers, or to be more accurate, their lack thereof. In pretty much every country (even Canada), the XZ1s will have a fingerprint reader built into the side-mounted power button. But in the US, we get nothing. The reason for this seems to be some unsepecified business deal that Sony made a few years ago, but rather than giving up on the region as a whole, Sony is forging on without a very important feature. At this point, fingerprint sensors are standard fare for any handset priced above $300, and the fact that Sony can’t figure out how to include one on its flagship phones is pretty sad, even if it’s just in the U.S. The power button also doubles as a fingerprint reader, unless you buy one in the U.S. Also, check out that dedicated camera button. 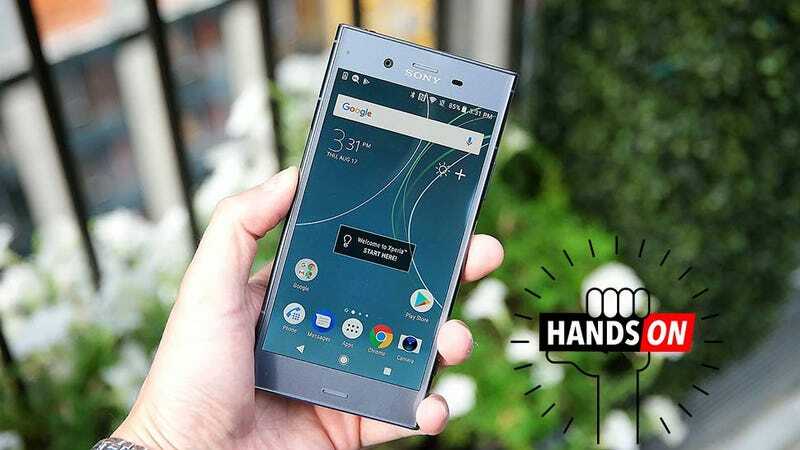 Then there are other things like the XZ1’s design, which hasn’t changed much since last year’s Xperia XZ, or really, since any one of Sony’s Xperia Z-series phones from even further back. Sure the the materials have changed from glass to aluminum, but that boxy body is pretty much the same. And while I’m not going to say that either XZ1 is ugly, their sizable top and bottom bezels are already out of style. Sony even went out of its way to build a weird 3D scanning feature into the XZ1's camera, so you can create 3D model of your face and transfer it over to a game or social media app. The problem is, no game or app makers are supporting 3D scanning integration, which means the feature is almost a pure tech demo. A pretty good selection of colors, except the pink one is going to be exclusive to Asia. Sony also won’t be partnering with any carriers to help bring these phones to the masses. Even an upstart like Essential was able to forge a deal with Sprint to get its phone a bit more exposure. That puts Sony on the same footing as OnePlus, except that with its pop-up stores and collabs with fashion brands like Collette, OnePlus is finding other ways to make people care about its unlocked devices. It also doesn’t support CDMA carriers. That means you’re left with just AT&T and T-Mobile, which is a shame for all the old Verizon customers who remember how good the Xperia Z3v was. There phones have potential, but there’s a few too many oddball decisions. Now don’t get me wrong. I think the XZ1 and XZ1 compact are pretty interesting devices. They have a lot of features (like Sony’s signature two-step camera button) that other phone makers don’t seem to care about, or at least, can’t be bothered to put on their phones. But Sony also keeps leaving too many things out and wasting too much time working on gimmicks, and I’m willing to bet that the XZ1 and XZ1 Compact aren’t going to change the fact that Sony isn’t even one of the top five (or top 10) phone brands in the U.S anymore. Every time I seen an Xperia in the wild, it’s like running across a four leaf clover or a VW Beetle with a blown-out headlight—it’s more novelty than a sound purchasing decision. Sony needs to do a better job of giving people features they want, or at least, give them the things they are expecting, or else people are going to continue overlooking what would otherwise be an appealing device. Who the Hell Is Going to Buy Sony&apos;s Weird Android Projector?